After three weeks holding the crown and number one spot at the box office, The Hunger Games: Mockingjay, Part 1 has been bumped from the throne. 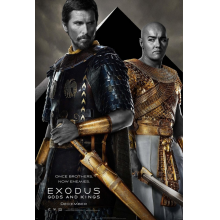 Exodus: Gods and Kings earned top honors in its opening weekend bringing in an estimated $24.5 million. With an estimated budget somewhere around $140 million, it’s a disappointing debut for Ridley Scott’s newest feature. The Chris Rock directed Top Five finished in the top five with $7.2 million in its opening weekend. It’s a decent start for a movie that could keep expanding to more theaters as we get closer to the Christmas movie season. Here’s the rest of the top-ten estimates from a underwhelming box office weekend.